“The children of the people who participated in the 1976 uprising are destitute." Tonight I am reaching out to every single South African, black and white, from the very depths of my being. A white man, full of prejudice and hate ... committed a deed so foul that our whole nation now teeters on the brink of disaster. A white woman, of Afrikaner origin, risked her life so that we may know, and bring to justice, this assassin. ... Now is the time for all South Africans to stand together against those who, from any quarter, wish to destroy what Chris Hani gave his life for—the freedom of all of us. But there is also this reality: Many South Africans under 40 feel little connection to the father of their nation. Articles about Mandela’s many health scares late in life (at press time, the former president had been in a hospital on life support for more than a month, battling a lung infection) often feature laudatory quotes from two kinds of South Africans—whites and older blacks—while leaving out the voices of young blacks, who have a more ambivalent relationship with their founder-saint. Some even resent him. Last year, I went to a new township called Diepsloot to speak to a group of young people about the change that had occurred in their country since 1994. Diepsloot is an unintended creation of South African freedom: a massive squatter camp sprung up on a swath of nearly uninhabitable marshland outside Johannesburg. It is populated by aspirants from South Africa’s deep rural regions. Apartheid had trapped blacks in the countryside with intricate restrictions on their movements. Once it began to crumble, a belated and swift process of urbanization began, in which rural blacks flocked to the cities to flee the joblessness in their native regions. The problem is, they haven’t found nearly enough jobs in the cities, either. It’s true that white South Africans have fared remarkably well financially post-apartheid. Only 9 percent of the shares of the top 100 companies listed on the Johannesburg Stock Exchange have moved into black hands, and whites still comprise 70 percent of senior management. Meanwhile, the truly eye-catching black economic advancement has been relatively confined to a high-flying class of black-liberation-movement veterans or their friends, the so-called “black diamonds” who now sit on the boards of formerly white-run corporations and drive tricked-out BMWs. A 30-year-old friend of Malomela’s, Mothakge Makwela, recounted how his perception of the black political leadership had shifted over the course of his youth. As a small child, Makwela loved Mandela. He also didn’t yet see himself as destitute. “But you start noticing economic disparities [between yourself and the black diamonds] when you pass matric,” the high school graduation exam. “When you get [to college], you start to notice you cannot pay. You start to notice you are very poor.” His ultimate conclusion, he said, was that “Mandela sold us out.” In the democratic transition, the black-liberation leaders “were representing themselves. ... Look at the Mandelas—the whole family is making a killing.” Mandela personally has never particularly flaunted his wealth, but his house is in Johannesburg’s version of Westchester—a leafy estate of soaring mansions and stately tree-shaded avenues—and his foundation is known for fiercely protecting the copyright on his iconic smiling visage, so that the wealth it produces redounds only to the family. His grandson led a heavily capitalized mining company that was later prosecuted for defrauding its workers. His granddaughters cashed in with a reality TV show. Prior to Mandela’s liberation from prison in 1990, the ANC had long advocated radical economic change, projects like the nationalization of mining and more equitable sharing of agricultural work and profits. 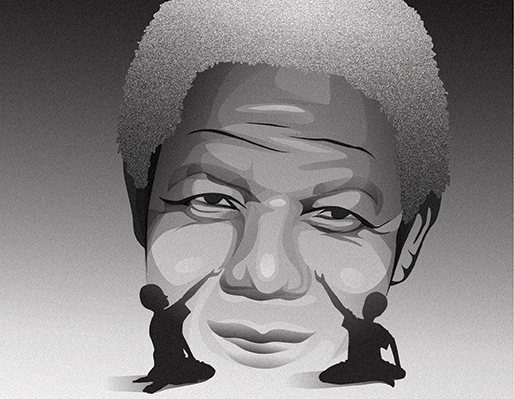 When Mandela was released, he began to make the rounds at Western economic summits, where he was quickly persuaded that such dramatic moves would be folly. “The arguments were that ... there would be a flight of capital and the economy would collapse,” said de Vos. An understanding emerged: The ANC wouldn’t touch big business if big business agreed not to leave the country and to incorporate blacks into top management. Unfortunately, this deal also resulted in a lack of entry- and mid-level job creation and the further entrenchment of an apartheid economy designed only to employ an insufficient number of low-level workers in fields like mining with little room for personal creativity or advancement. The past year has seen an increasing number of strikes and protests over poor blacks’ lack of economic advancement. “There will be radical change,” Malomela predicts. “You see what happened in Egypt.” If a consensus builds on the South African street around the idea that most blacks didn’t profit substantially from their liberation—if the belief hardens that the country is due for a belated revolution—then the national understanding of Nelson Mandela’s era may shift. The legacies of major leaders are always evolving. Oliver Cromwell was given a king’s funeral at Westminster Abbey, only to become the object of such general British revulsion several years later that his body was disinterred and posthumously hung and the head then impaled on a stake. Centuries later, as Cromwell’s record was revised upward, a grand statue of him was unveiled near where his pierced skull had sat. It amazes me that there are so few substantial biographies of Mandela. So much about his full record is yet to be assessed. There will be many obituaries for him, but today the story of how we will remember him is only beginning to be written. Eve Fairbanks, a writer living in Johannesburg, is working on a book about post-apartheid South Africa.